Sometimes life comes at you hard, and you have to not just survive, but grow and thrive. Like this scrub tree at the top of Lava Butte., south of Bend, Oregon. This tree, which is only about 18 inches tall, would probably normally be several feet tall. But the winds, snow, rains, and incessant summer sun keep it in check. It’s beautiful nonetheless, don’t you think? It pretty much conveys how I feel these days. Challenged by life, but still working hard to make the best of things and rise above the difficulties that have been thrown my way. With that in mind, I was anxious to join my parents for a week of fun, sun, relaxation, and good times in Sunriver, Oregon. 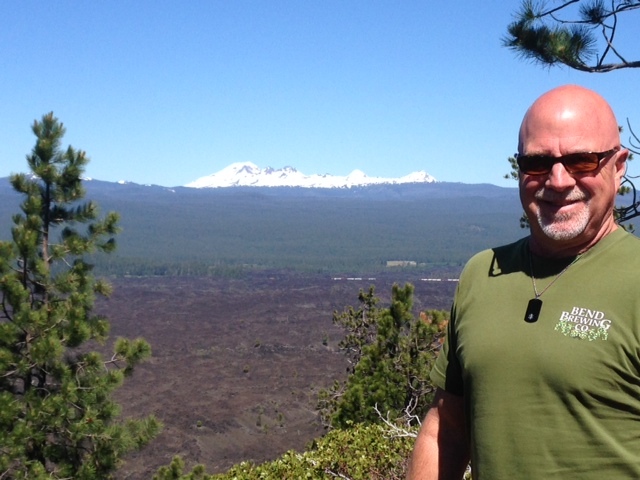 I started the trip with a solo drive from our home in Hillsboro east and south to Sunriver. There’s nothing quite as soul cleansing as singing at the top of your lungs because no one is with you. I covered it all–the Eagles, Steely Dan, Death Cab for Cutie, Madonna, and lots of others, and ended the set perfectly with Fleetwood Mac’s Thrown Down as I pulled into the driveway of the home my dad has for the week. Bill drove over earlier in the day because he can’t stay as long as me, and thankfully, he didn’t need to listen to me sing. That was yesterday. 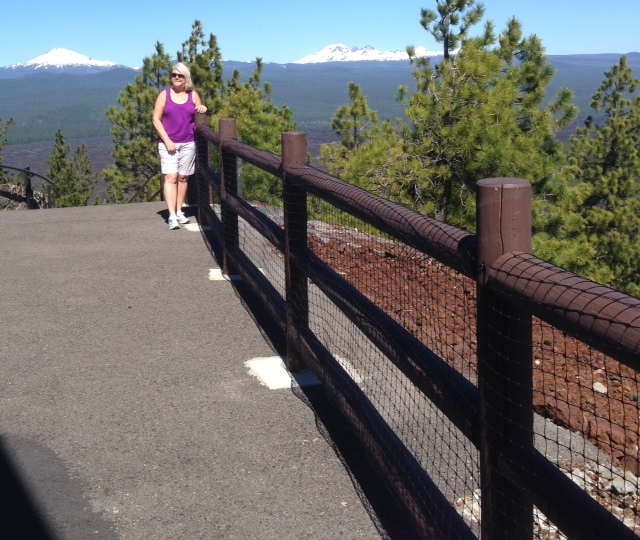 Today I started the day with a run on the paved trails in Sunriver, with my mom and Bill keeping company. I ran and they walked; I doubled back every run phase to connect with them. So fun! And what a great way to at start the day. By mid-morning we were all ready for adventure so me, Bill, Mom, and Dad headed to Lava Buttte, which is a few miles north of our temporary home in Sunriver. We drove up the spiral to top of the butte. After parking, Mom and I hiked up to the fire tower while Bill and Dad spent time on their short wave radios. Here’s Mom and I at the top of Lava Butte. What a view from up there! We enjoyed beautiful 360° views of Oregon. We hiked around the crater. At the halfway point we stopped to enjoy the view. Lots of easy–but beautiful–hiking. Soon it was lunchtime. So off we headed to 10 Barrel, our favorite Bend respite. 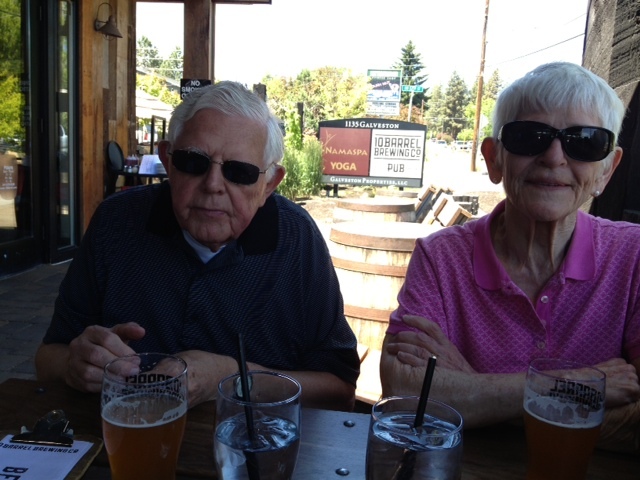 So here we are, with Mom and Dad enjoying a much deserved refreshment.